For years, the topics of aging in place and universal design have become common terminology and best practice when designing homes. These design considerations apply not only for those with disabilities and older generations, but also for a larger slice of the population, the baby boomers, who plan to stay in their homes as they age. 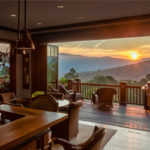 As over 76 million baby boomers prepare to enter retirement in the near future, a significant portion of the US population will be looking for their homes to not only suit their current lifestyle, but have design aspects that help prepare them for the future as they are presented with more aging-related challenges. 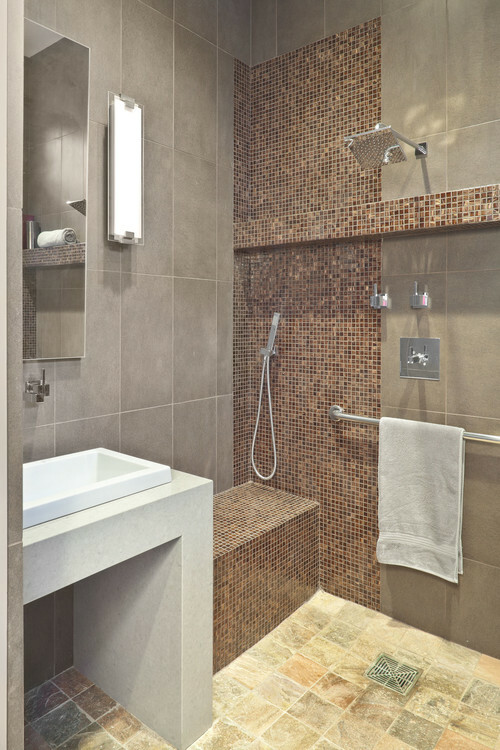 Whether they decide to make modifications to their current home or to make a move to their forever home, universal design products are plentiful. Thanks to recent design advancements, universal design products are less “institutional” and more aesthetically pleasing. Remodeling and custom home design can integrate aging in place design and products that merge essential function with aesthetic appeal. 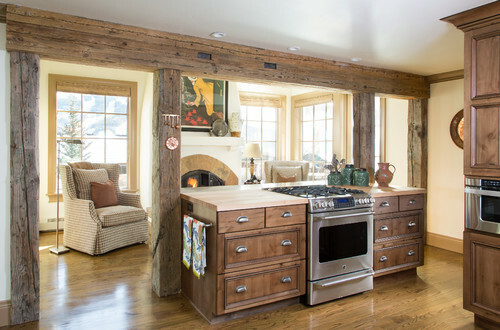 Often, it’s automatic to picture aging in place with handrails and less than attractive cabinets; however, more manufacturers are realizing the importance of revamping their product lines to blend into the home. 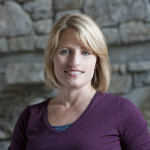 Aging in place design has many spaces to consider when designing, or redesigning, your home. ADA compliant toilets that are between 17”-19” high and vanities that are either wall mounted or pedestal are ideal for wheel chairs to roll up to. 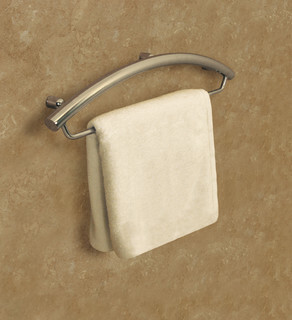 Some grab bars have soap and shampoo dishes built in for even more function. 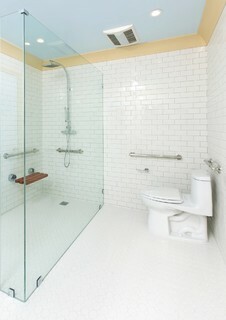 Barrier free/curbless showers are great solutions as homeowners need easy solutions to bathing. Shower benches don’t have to look like they came from the hospital. 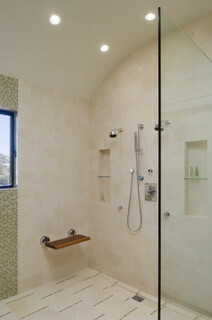 Modern day benches can be incorporated into the shower walls or added later on. Faucets that are easy to turn on and off are quintessential for those who suffer from arthritis or other ailments that affect the function of their hands. The work space should be as barrier free as possible to make it as easy as possible for those with disabilities to utilize all of the kitchen. 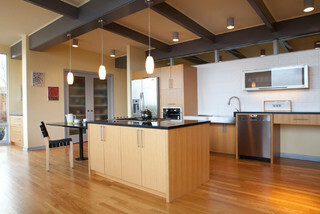 Remember spacing between any island or furniture should be maximized. Cabinetry height should be adjusted to a height where everything is easily within reach, and toe kicks must be taller in order to access cabinets without problem. 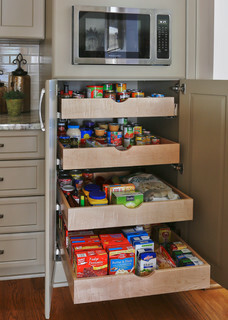 Also consider pull out shelves in the lower cabinets to avoid problems with accessing items in the back of cabinets. 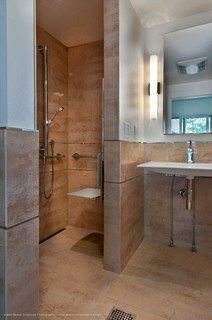 Faucets and door knobs are hard to use when the homeowner has a hand disability. Incorporating levers and pulls rather than handles that require a stronger grip is ideal. 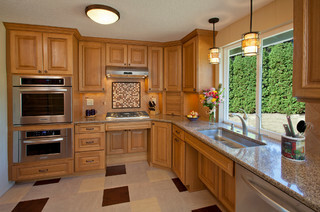 Sinks and cooktops are highly utilized areas of a kitchen. 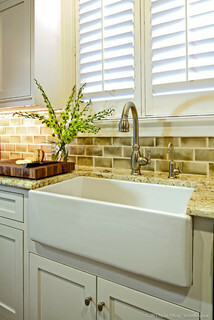 Consider shallow basin sinks and recessed cabinet fronts.